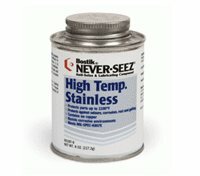 A stainless steel, graphite, aluminum based anti-seize compound formulated to protect up to 2200°F against seizure and galling, galvanic and severe environmental corrosion. It was specifically designed for applications that cannot use nickel based products. Tested to MIL-A-907. Fasteners in steel mills and power plants. Stainless steel pipe fittings, flanges, pump fittings and unions.